We're all guilty of it at one time or another. You see that juicy bot wave and figure your jungle and support can handle securing dragon. Next thing you know, first infernal drake is down and the enemy Rengar's got a double kill. Next time, help your team ya greedy nit. If you're split pushing as someone like Tryndamere or Fiora it's one thing, but if you're splitting with a champion with low tower crushing potential like Maokai, you better be sure you either have teleport or your team is well-equipped to handle the 4v5. Else, when they get "caught" by Sion + Nocturne ult, it's really not just them to blame. Trying to justify situations after they turn out badly is ok if you say something like, "sorry, didn't see the jungler there". On the other hand, if you find yourself typing excuses more than playing, you're probably handicapping your team. Believe it or not, there are plenty of people out there who will willingly give up their main role for a role they barely play just to "be nice" in an attempt to get carried. Before you ask to swap though, always make sure you look them up to see if they can actually play the role you want them to switch into. If you don't, you might get to see their legendary 2% win rate Tryndamere jungle. Contrary to popular advice, there IS such a thing as buying too many wards. If you're unable to defend a control ward location and find yourself repeatedly buying one on every back just to get it destroyed while you huddle under your turret, you may be buying too many. Some people also like carrying three at once on the support, which is overkill in almost any situation and delays combat stats. Some team compositions are designed to win lane early and some are designed to turtle and/or team fight. It's important to identify what your team does best and not run Teemo + Kassadin into unnecessary team fights against Maokai + Brand. This one mostly relates to marksmen carrying heal. Sometimes an ally truly is unsavable as a thousand Syndra orbs come flying. Other times, you're hoping that last tick of ignite won't kill. Don't let that tick kill your ally while you still have heal...kthx. 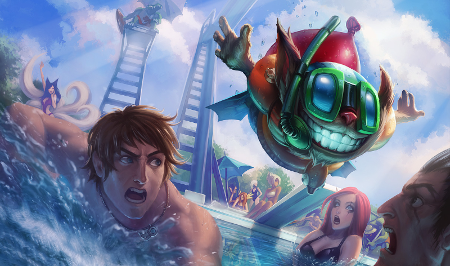 If your lane opponent roams and you don't follow, don't be caught freezing your lane at your turret. The only thing worse would be if you request your team to stop feeding your laner afterwards...that might go into the active sabotage category. I get that most of you are Millennials with commitment issues. However, if your team decides to do Baron and you decide to peel off by yourself halfway through to watch your team lose Baron and get aced, you're not going to make any friends. If you want to go into the active sabotage category, tell them you knew it was a bad idea all along. Ask to pick something "OP"
Many of you have probably experienced this before. A teammate says something like, Zed is open, pick him or we lose. Next thing you know, your Zyra one-trick is suddenly playing Zed for the first time. If you haven't looked your allies up, don't make pick suggestions. There are many things you can do inadvertently that might negatively impact your game. If you're looking for things you can do to positively impact your game, be sure to check out the aptly named, Top 10 Ways to Positively Impact Games article too!